Gov. 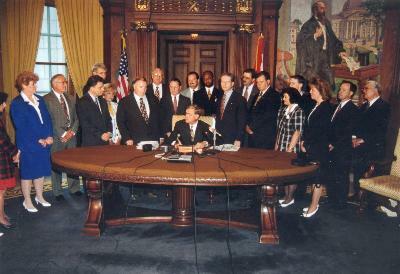 Mel Carnahan signs the official legislation changing the University’s name to Truman in 1995. Ten years ago on June 15, 1995, University administrators and Board members, legislators, CBHE representatives, alumni and friends gathered with Gov. Mel Carnahan in his office in Jefferson City, Mo., for the official bill signing of the legislation which changed the University’s name to Truman State University, effective July 1, 1996. Ten years earlier on June 20, 1985, Gov. John Ashcroft signed legislation effective Jan. 1, 1986, that changed the University mission from a regional university to a statewide public liberal arts and science university. The spring valedictorians gather prior to commencement May 14. 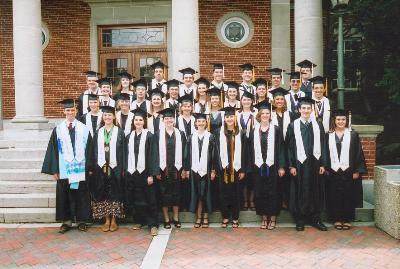 Thirty-two graduates received top honors at Truman’s spring 2005 commencement ceremony May 14 at Stokes Stadium. Each valedictorian had a perfect 4.0 grade point average for all subjects. Valedictorians included Audrey Armstrong, Collin Ashmore, Christopher Bay, Leigh Ann Bolton, Sarah Brown, Joy Chisholm, John Crossett, Sarah Dance, Amy Endicott, Wyatt Feeler, Amber Gordillo, Micah Hainline, Rodney Hoover, Jeanette Jackson, Nicholas Kremer, Evan Merrell, Evan Montgomery, Jaclyn Payton, Lindsey Quinn, Laura Reber, Sarah Schack, Rachel Scheperle, Jamie Sharp, Rhiannon Shoults, Kristina Sis, Sarah Starnes, Mackenzie Taylor, Diana Upton-Hill, Jonathan Waits, Nathan Wales, Ryan Walsh and Brett Werenski. Students from Truman’s Clinical Experiences in Teaching interim class present a flag to Ray Miller Elementary School Principal Marianne Farr May 24. Truman State University students Laura Tabor, junior English and pre-education double major from West Des Moines, Iowa; Christine McNichols, junior English and pre-education double major from Ballwin, Mo. ; Shea Roberts, junior communication disorders and pre-education double major from Platte City, Mo. ; and Stefanie Tune, sophomore psychology and pre-education double major from St. Charles, Mo. ; presented a Missouri flag to Ray Miller Elementary School Principal Marianne Farr May 24 in front of the elementary school. The Truman students taught an introductory unit on Missouri concentrating on famous people, landforms and major cities in conjunction with Truman’s Clinical Experiences in Teaching interim class. As a final activity with the third grade students in the classes of Janet Hanley, Carol Fox and Jeneen Brown, the Truman students treated the third-graders to ice cream cones, which the students learned were introduced at the 1904 St. Louis World’s Fair. Cantoria and Brass Ensemble members practice prior to leaving for their two-week tour of Italy and Greece. The Truman State University Cantoria and Brass Ensemble embarked on a two-week tour of Italy and Greece May 18. Twenty-eight Truman students and three Truman faculty members participated in the tour, which included concert performances as well as visits to museums, churches and other tourist activities. 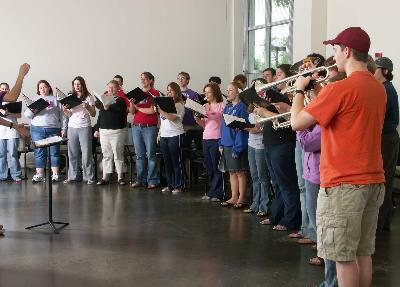 Mark Jennings, assistant professor of music and director of choral activities, led the choir. The Brass Ensemble and Cantoria performed separately and together for the concerts. Jacqueline Collett, associate professor of music, and Greg Jones, professor of music, also performed a soprano and trumpet duet. The program included works by Palestrina, Schütz, Croce, Scarlatti and Bach, as well as selections of world music and several American folk songs and spirituals. The group’s itinerary included Lake Garda, Venice, Cremona, Florence, Lucca, Sienna and Jesi in Italy, and Corfu, Delphi, Athens and Corinth in Greece. The tour concluded with a concert at the American College in Athens before they returned home June 1. Eighteen students received General Honors May 13. The students who received their medals include (front row left to right) Ryan Walsh, Erica Campbell, Amenyedu Adovor, Sarah Smith and Laura Whitted; (middle row left to right) Mark Swanson, Jeanette Jackson, Virginia Nolker, Jason Weber, Veronica Ory and Abigail Souders; (back row left to right) Sarah Starnes, Joanne Appleby, Steven Jones, Micah Hainline, Christopher Bay, Evan Merrell and Jack Rodemann. Truman faculty and students presented at the Missouri Speech Language Hearing Association (MSHA) Convention that took place April 7-9 in Osage Beach, Mo. Paula Cochran, professor of communication disorders, was the faculty mentor for the poster sessions for Sucher, Jones, May, Conine, Bailey, Bohlmeyer and Smith. Amy F. Wilson, assistant professor of communication disorders, was the faculty mentor for Schmidt’s poster session presentation. Several students also gave oral presentations at the MSHA 2005 convention. Sucher presented “Comprehension Deficits in People with DAT Due to Syntactic Complexity.” Wilson was her faculty mentor for this presentation. Janet Gooch, associate professor and director of communication disorders, was the faculty mentor for Suddarth, Bertel and Bailey. Faculty members also presented at the MSHA 2005 convention. The Missouri Department of Natural Resources is offering an Environmental Education Scholarship Program (EESP) designed to provide scholarships to minority and other underrepresented students pursuing a bachelor’s or master’s degree in an environmental course of study. Applicants must be current Missouri residents and graduates of an accredited high school. Applicants also must have a cumulative high school grade point average of 3.0 on a 4.0 scale or if enrolled in college, have a cumulative GPA of 2.5 on a 4.0 scale, and enrolled as full-time students in a Missouri post-secondary institution. Qualified candidates must be pursuing a degree in one of the following areas of study: civil, chemical, mechanical, agricultural engineering or environmental engineering; environmental areas such as geology, biology, wildlife management, planning, some aspect of a natural resource management or a closely related field; environmental chemistry or environmental law enforcement. Applications are available in the Truman State University Financial Aid Office located in McClain Hall 103. Applications are due July 1. The following Truman students placed at the 99th percentile on either the Academic Profile or at least one module of the Collegiate Assessment of Academic Proficiency (CAAP) exam during the fall 2004 or spring 2005 semesters. The Academic Profile is a test of general academic knowledge and skills. The test covers three academic areas - humanities, social sciences and natural sciences - measuring college-level reading, writing, critical thinking and mathematics. The CAAP consists of five objective test modules - writing, mathematics, reading, critical thinking and science reasoning. Students are randomly assigned to take three of the five modules. 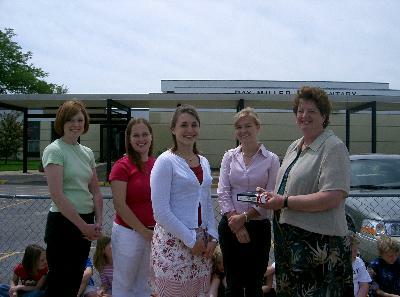 The following students placed at the 99th percentile on the Academic Profile during the spring 2005 testing administration: Amanda Bail, Kristi Baur, Jordan Bergsten, Emily Chadwick, Erin Clark, Shea Cleveland, Jennifer Crawford, John Durham, Lucy Eberhard, Christopher Edwards, Eran Feintuch, Justine Finney, Shaine Griggs, Kristin Harkins, Maryellen Harman, Marek Haruza, Lara Hause, Rebecca Hoelting, Aaron Hotfelder, Matthew Johnson, Ryan Johnson, Josh Kelly, Rebecca Maddox, Kendra Marner, Katherine Neville, Matthew Seibert, Katie Simonds, Maria Spilker, Danielle Stacy, Paul Strauss, Daniel Tucker, Emily Turner, Kathleen Warrington, Andrew Whelehon, Heidi Willhauck and Stefani Wittenauer. 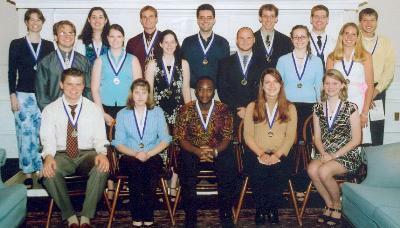 The following students placed at the 99th percentile on the Academic Profile during the fall 2004 testing administration: John Allen, Shannan Anderson, Collin Ashmore, Alicia Barks, Ryan Beiermann, Emily Callahan, Lauren Cepicky, Matthew Cochran, Aaron Cooper, Casey Copeland, Stephen Duepner, Kathryn Fancher, Erica Fitzgerald, Sarah Garber, Kimberly Getman, Christopher Gillette, Peter Guirguis, Arthur Harrill, Jennifer Hinkle, William Hodgson, Benjamin Holley, Stephen Huss, Robert Kelchen, Ryan Kelley, Jonathon Lawinger, Juli Lommel, Sarah Maddox, Claire Maryniak, Daniel Matheny, Erin Musko, Camille Phillips, Matthew Raper, Linda Schulte, Nichole Sevic, Brian Slattery, Peter Snoblin, Gerald Sontheimer, Neil Stransky, Stephanie Turner, William Vierling, George Wang, Kendra Woods and Andrew Wright. Tanya Horvath placed in the 99th percentile on the writing, reading and science modules of the CAAP exam. She was the only student to place at the 99th percentile on three modules. The following students placed at the 99th percentile on two CAAP exam modules during the spring 2005 semester administration: Jesse Holt, Dennis Trinkle, Julia Redford, Melanie Dunn, Kevin Dyke, Katherine Eusey, Lauren Johnson, Megan Kennedy, Katherine Langston, Kevin Martin, Jennifer Miller, Carla Pepmiller, Kelly Reed, Jonathan Baker, Joseph Donahay, Holly Magdziarz, James Park, Jeffrey Scott, Allison Shaffer and Lacey Sloan. The following students placed at the 99th percentile on one CAAP exam module during the spring 2005 semester administration: Sara Babler, Shaina Bauman, Kara Beck, Courtney Berg, Laura Blakely, Bradley Brown, Erik Buatte, Wesley Campbell, Carrie Causino, John Clary, Kelli Criswell, Shannon Crowder, Ashley Desmet, Kathryn Droste, Lisa Field, Patricia Garrett, Christopher Gore, Ben Greenberg, Edward Grimmer, Breann Hazlett, Craig Hermann, Lija Kaleps Clark, Kyungwoo Kim, Kathryn Krieger, Amanda Kueper, Danny Lyskowski, Haley McCreery, Stacy Peter, Erin Roper, Lisa Rubenthaler, Caitlin Sapp, Allison Scharf, Amy Schweizer, Travis Sewell, Jana Sigler, Jason Simpson, Lissa Snyders, Elizabeth Sorensen, John Sturgeon, Patrick Tebeau, William Tollerton, Kyle Torres, Ashley Walker, Kate Wertz and Cynthia Woolridge. The following students placed at the 99th percentile on two CAAP exam modules during the fall 2004 semester administration: John-Paul Allen, Megan Lenahan, Chad Cooley, Douglas Worley, David Teeters, Oliver Penrose, Kyle Hirschman, Casey Carroll, Dean Dennehy, Erin Murphy, Jennifer Jones, Paul Blessing, Erinn Fry, Amanda Cone and Amanda Barr. The following students placed at the 99th percentile on one CAAP exam module during the fall 2004 semester administration: Mary Wims, Patrick Wilmes, Jacquline White, Rebecca Vice, Steven Sholtz, Ashley Phillips, William Klutho, Emily Finnegan, Jared Erwin, Sean Cooper, Stefanie Schroeder, Sabrina Sandeen, Cassandra Runge, Elizabeth Robinson, Chris Radigan, Curtis Niewald, Sara Miller, Jessie Krause, Jason Hull, Joseph Hollister, Benjamin Hingst, Matthew D. Dunn, Jon Becker, Michelle Alford, Samuel Murphey, Nina McCrate, David Kreidler, Caleb Jorden, Joanna Grillas, Avril Frick, Sarah Deady, Richard Claiborne, Kelly Bultman, Marcus Yokeley, Olumuyiwa Sowunmi, Christopher Sides, Kyle Roff, Violet Poole, Ikechukwu Okonkwo, Julie Laub, Laura Kopff, Eric Hutchins, Amy Hoeksema, Katherine Hartmann, Chris Halsey, Anna Halim, Brandon Gordon and Nathaniel Gonner. Students living off-campus should update their local mailing address with the University via TruView. Address changes can also be made in the Registrar’s Office, McClain Hall 104. Students are responsible for all information sent to their local mailing address from University offices and personnel conducting University business. If you have made any changes in your course schedule(s) since you submitted your graduation application and have not yet updated your application with the Registrar’s Office, you need to do so by June 10. Updates can be made in the Registrar’s Office, McClain Hall 104, Monday through Friday between 8 a.m.-5 p.m. You do not need to complete a new application. Hours will vary for Independence Day holiday. Call 785.4484 for more information. The next issue of the Truman Today will be June 21. The Truman Today is printed biweekly during the summer. Submissions for this issue are due by June 15 to kbest@truman.edu. The Staff Council Spirit Committee will meet to discuss having a Truman entry in Kirksville’s All American Red, White and Blue parade. The parade will take place at 3 p.m., July 4, in downtown Kirksville. The committee will meet at 10 a.m., June 8, at Mainstreet Market. Staff members who are interested in volunteering their time or supplies for the parade entry should attend this meeting. Contact Kimberly Titus at ktitus@truman.edu if you would like to help and cannot attend this meeting.